Here at Alchemist Jewellery in Bude, we stock a large range of classic and contemprary pieces of jewellery in an array of metals and mediums including platinum, palladium, gold, silver, tungsten, titanium, Cornish tin and leather. In our modern and well equipped jewellery workshop, our experienced jeweller is able to undertake all types of jewellery repair. From resizing rings, soldering charms and rejoining chains to laser micro welding tips on claws. 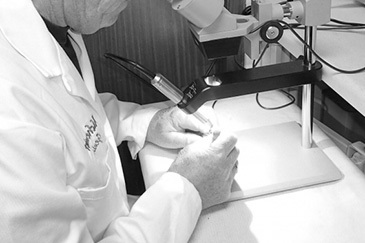 Our jewellery repairs are available in most metals including platinum, palladium, gold and stainless steel. We are also able to replace watch batteries and alter watch bracelets and straps. Our jeweller also designs and manufactures bespoke jewellery pieces, undertakes special commissions and provides jewellery restoration and jewellery remodelling services. In addition, Alchemist jewellery offer a specialist jewellery cleaning service.